Covering a wide area in the form of a twin settlement, Lower Dharamshala (1380 m) is a busy commercial center, while Upper Dharamshala (1830 m) with the suburbs of McLeodganj and Forsythganj, retains a British flavour and colonial lifestyle. The charming church of St. John in the wilderness is situated here and this is final resting place of Lord Elgin, a British Viceroy of lndia during the l9th century. There is also a large Tibetan community who have made this their home. Numerous ancient temples like Jawalamukhi, Brijeshwari and Chamunda lie on the plains below Dharamshala. Miniature Paintings from the 17th century, elaborately embroidered costumes of tribal people, wood carvings and tribal jewellary are kept in the museum. 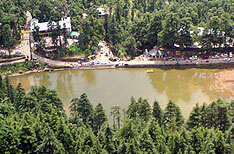 11km from Dharamshala and surrounded by deodar trees, the lake fills a mountain bowl, On the motor - road, this is an enchanting and serene picnic spot. Established in 1850's as a british garrison and the home to the semi-normadic gaddi tribe. 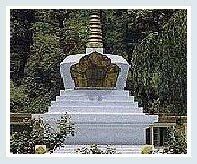 A number of residential buildings, restaurants, antique and curio shops, together with famous Tibetan institutions have lent importance to McLeod Ganj. The Budha temple is situated opposite to the present abode of His Holiness, the Dalai Lama and is worth a visit. The Tibetan Institute of performing Arts(TIPA) is 1km. 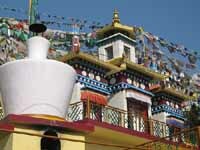 walk from McLeod Ganj and preserves a number of musical dance and theatrical traditions of Tibet. It holds an annual 10-day folk opera commencing on the second Saturday of April. There is also a Tibetan handicraft centre situated at McLeod Ganj and a Sunday market is organized at about 10 minutes walk from here. 14 kms from Mc Leod Ganj and 4 kms from Dharamshala set amid gardens with shady paths, woodenbridges, small streams and tiny waterfalls. This complex has been established to teach traditional Tibetan Art such as wood-carving, thangka painting, gold work and embroidery. 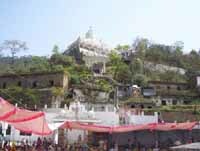 The famous temple of Jwalamukhi is 30kms. from Kangra and 56 kms from Dharamshala. Dedicated to the "GODDESS OF LIGHT", the temple is one of the most popular Hindu temples in northern India. There is no idol of any kind the flame is considered as a manifestation of the goddess. An eternally burning and shining blue flame emanates from the rock sanctum and is fed by the priests with the offerings of devotees. The golden tower (dome) of the temple was a gift from the Emperor Akbar. 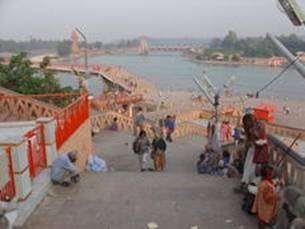 Two important fairs are held here during the Navratras in earlier April and mid October. Known for its monolithic rock temples, Masroor is 15kms. south of Kangra. There are 15 rock cut temples in Indo-Aryan style and richly carved. The temples partly ruined now are profusely decorated with sculptural ornamentations , conceived in the same manner as the great temple of Kailash at Elora in Maharastra with which they bear a striking resemblance. The main temple is dedicated to Lord Ram, Lakshman and Sita.